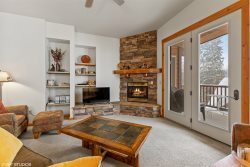 This condo is located in a beautiful setting right on Whitefish Lake, MT. The condos location also makes it convenient to go explore downtown, Glacier National Park, Whitefish Mountain Snow and Summer resort, or any of the many great things in the area. The 1 bed, 1 bath condo is a great place to call home while on vacation in Northwest Montana. The condo has a open concept with the kitchen flowing into the dining and living area and great views onto the lake. The bedroom has one queen bed and a bunk bed, and the living room has a pullout couch. © 2019 | IBEX Properties LLC - All rights reserved.